How do you unwind, the tug of a thread unweaving the knots and snags of your day. The exhale at the end of a day. Imbibe. I wanted to make something classic steeped in simplicity and with a firm toehold in Spring. A cocktail to ease the fading and blooming from one season to the next. Made with the last remnants of your winter pantry, but with a clear nod to Spring. The abundance yet to come. 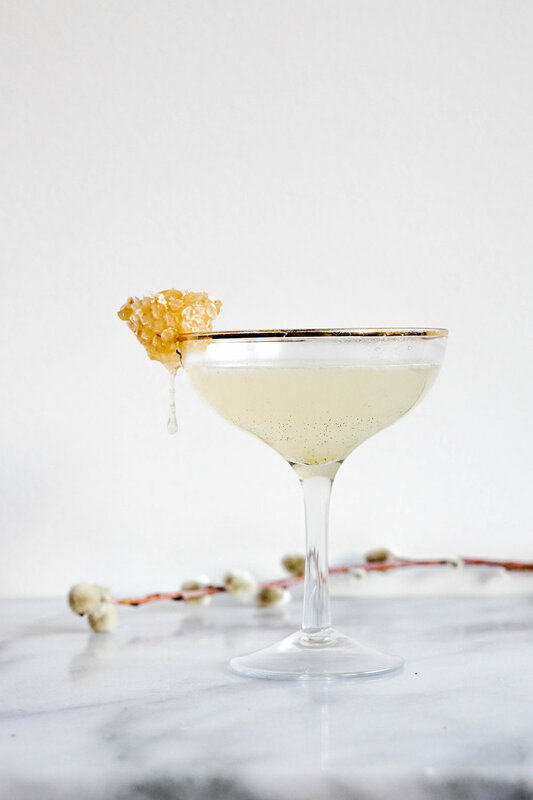 This is my take on the Bees Knees; Gin forward and herbaceous, a drink that was born during the height of prohibition to conceal the slightly less than drinkable bathtub gin. I promise it tastes better with quality gin - but hey no judgement here, gin is gin. And we're old friends anyways, just raising a glass to the starry night above. Measure out a 1 cup of sugar into a mortar and pestle. Zest a lemon on top of the sugar and work the zest together with the sugar until it is damp and fragrant. Add lemon sugar to a saucepan with 1/2 a cup of water and over medium heat bring just shy of a boil. Stirring until the sugar is completely dissolved. Take off the heat and stir in 1 tablespoon of lavender to the simple syrup and let steep for five minutes. Strain out lavender with a cocktail strainer and add roughly 1/2 cup of raw honey to the syrup. Let cool and store in a refrigerator for up to one week. To extend the life of the syrup add 1 tsp of gin or vodka. Measure out equal parts Lavender Simple Syrup, Gin and freshly squeezed lemon juice. For a single cocktail use 1.5 ounces of each. Add all three ingredients into a shaker with two cubes of ices and shake until well combined and ice cold. Strain and serve in a coup | martini glass, with a dash or two of plum bitters. Garnish with honeycomb whenever, if ever possible. I assure you it's worth it.